Dieser Beitrag gliedert sich in zwei Teile. Zunächst berichtet Michel Chevalier über eine Aktion, die an der Kunsthochschule Grenoble parallel zu der Demonstration gegen die Politik Sarkozys stattfand. im Anschluß finden sich die Ergebnisse dieser Aktion: eine Liste von über 150 Fragen, die Julia Bonn ins Deutsche übersetzte. A sunny morning in this city, nestled between three plateaus and two rivers. It's 10 am, 25° Celsius, with snow-capped mountains and ridges framing the action below. 300 high-school students have blocked the entrance to their school. A demonstration is getting on its way and the obvious target is Nicolas Sarkozy, elected exactly one year ago to the day. 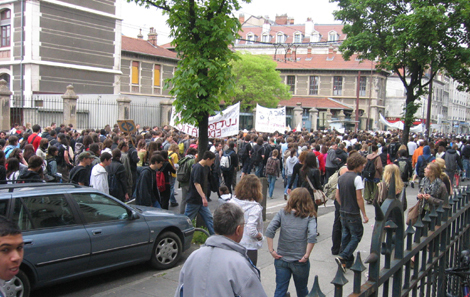 Sarkozy's plans to introduce mandatory 'files' (fiches) for all students — to which parents are under the obligation to contribute information about their ethnicity, income, even their 'resident status' — is the issue of today's protest. 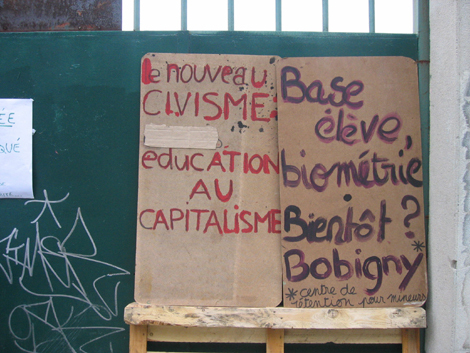 "The new civics: education in capitalism"
"Student database, biometrics... then Bobigny youth detention center?" No boogeyman target, or even clearly political measure has sparked this activity. It's simply that two professors and their students have decided to use the opportunity of an 8-month vacancy of the director's post to ask some questions about the orientation and social meaning of their establishment, and of art education. Is this activism, too? an experimental teaching method? a 'down-to-earth' method to teach experimental art? ... or just a proactive welcome for the new director? A call for submissions was issued: all students were invited to (anonymously) submit up to seven questions. Over twenty students took up the offer and a workshop has convened this morning to deal with the 100 entries in two 3-hour sessions: "questions and problematics" for breakfast, and "hypothesis for pedagogical dispositifs" after (a 2-hour) lunch break. Fifty students (a third of the student body) pass through over the course of the session in the cafeteria, whose walls had been plastered with the questions. # 73. How is autonomy taught? How is autonomy learned? How is autonomy developed? How is autonomy evaluated? How is autonomy appreciated? How is autonomy enriched? #91. Are professors motivated to teach things in depth here, or is it more a choice by default, taken on without much enthusiasm and dictated by an instinct of survival (le nerf de la guerre)? # 59. Who manufactures the identity of this school? # 58. Is the ESAG a school of "(individually) getting out of messes" (se démerder)? # 32. Does the bourgeois cultural tradition – sprung out of a romanticism that edifies forms of spontaneous genius, instinctive or unconscious – still linger at this school? # 44. Is an art school a sub-system of the commercial "contemporary art" system? # 42. Why are there schools for becoming and artist, filmmaker, or musician, but none for becoming a writer or a poet? # 87. Shouldn't the school admit students who are older, with more experience, who can better work in connection with reality? # 93. Is an art school nothing more than buildings? Couldn't we school ourselves elsewhere? 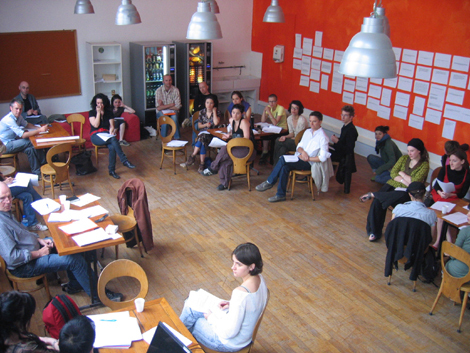 Have class in public space for meetings, discussions... in which there is no need for tables? Why not delocalize the conferences to "non-art" venues? And, inversely, invite speakers chosen by this other structure? Shouldn't an artist be open? interested by current events... literature, science, philosophy, history...? #70. What follow-up can students get after graduation? #64. How can we increase awareness of our school in Grenoble? # 103. Can we imagine an administration of the school that gives more power to students? #4. Is it possible to praise an art education without techniques, even though students want to learn these? #29. Is it possible to organize a student's film-club, with one session per week aimed at sharing and debate? Procedurally, things go like this: the first question is read out, commented by the speaker, who then selects another question and a next "victim" who, in turn, repeats the process. And this goes on 2 hours. The author of the question (if present) may clarify his or her ideas, but no one else – this keeps a rather quick pace, and maintains the urge to retackle (or devour, or pummel) certain formulations in the later session. Co-organizer François Deck, in one of only three interventions this morning: "the point is to sweep through the questions." "Why do we always have the impression that people are putting obstacles before us?" "What are our career options after studying art?" -the creation of a free-access "idea-box"
-having the possibility of launching a school-wide debate on a regular basis. Last, but not least, afternoon groups actually formulate concrete demands for the coming year(s), often taking up what was discussed in the morning (the "rules of the game" booklet, the debates, the idea box), or treading new ground: a semester where the first year students work among themselves, the hiring of a philosophy professor, the cultural studies classes for first and second-year students being merged, history being injected into technical instruction. One question reads: "Our school is in dire need of technicians. Could we consider hiring a technician in the field of concept art?" Dire need or not, at least things are so far here at the "intermodules days" that the participants walk the talk: true to concept-art precursors such as David Lamelas, Stephen Kaltenbach, Ian Burn, Lee Lozano (who all produced 'dialogue pieces' or 'offered problems' in the period '69/70), the texts are presented in a no-nonsense font and the sheets are all the same color. The cutesy typo-playing "innovations" à la Documents sur l'art/Le Consortium/art relationnel (or scrawling à la "conceptual drawing") have gotten the cold shoulder. 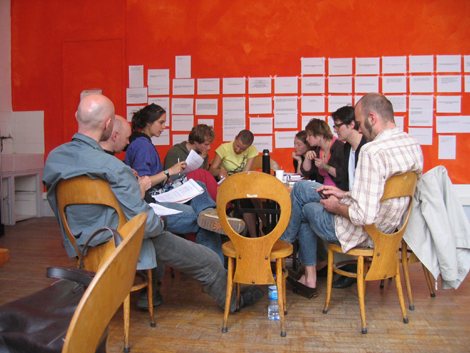 The open call includes the request: "One question per page 21x29,7 horizontal format. Helvetica type, bold face, 24 font. This unique format will serve legibility." It's not obvious to do this, not today, and I like the result. "Would it be possible to get toilet seats?" The ESAG had its phases of notoriety a few years back, Thierry de Duve having profiled the school as somewhat of a star-system-instrument in his 1992 book Faire École. Ange Leccia and Jean-Luc Vilmouth spawned a generation of canny post-duchampians I won't mention here. On the other hand, recent Grenoble history sets it considerably apart form other French cities its size: a politicized hot-house, it had a wave of what the French call 'auto-gestion' (self-management) initiatives in the '70s. (4) Jean-Luc Godard, even, moved to Grenoble in this period. As elsewhere, the '80s dealt a blow. Mitterand sucked out many of the city's activists towards Paris, where they were either disillusioned or coopted. Meanwhile, corrupt rightist Alain Carignon leapt in the vacuum and was elected mayor. Today, the city's squats are trying to stay intact and in place (the 102, by the way, also putting on one of the best film and music programs in Europe), but in Paris people (ok, maybe squatters, actually) will talk about the way folks in Grenoble stand out for being "solidaires." Several locales have been shut down under the current government and, with Grenoble becoming a center for nanotechnology, a lot of the leftist political debate (and direct action) is zeroing in on the nexus of knowledge, participation, and social vision (there is a big "de-growth" movement here, and Bureau d'Études produced a very commendable poster called "Grenoble: laboratory-city" in 2004). This morning and afternoon, students and (about 6) teachers are animatedly springing from one interrogative site to the next, while trying to kindle whatever wish-flames they have already lit. It seems to me like a generation of politicized youth is struggling for shapes that collective, non-cynical, action could take. At several points students berate their classmates to speak from notes instead of endlessly extemporizing, or formulate a demand instead of a question. Self-directed analysis of outlying reality seems as much a challenge now as it was for the Russian constructivists in their day. Part of the effort seems to come from the fact that, all of a sudden, its seems like the whole group is shoulder-deep in the complex operation of collectively building an edifice which is invisible to all, and whose dimensions are hard to gauge up against the surrounding school walls, mountain ridges, and European policy directives. "The revolution will not be exhibited in an art gallery"
Three hours into the session, a voice chimes out, "if you don't take notes of what's important to you, it will be forgotten, not archived, and we will be starting this process over and over again... for years!" I had the pleasure of hosting Deck for a session of the game in Hamburg last August 25. (3) XV Biennale de Paris, p. 40 (Author’s translation from the French). 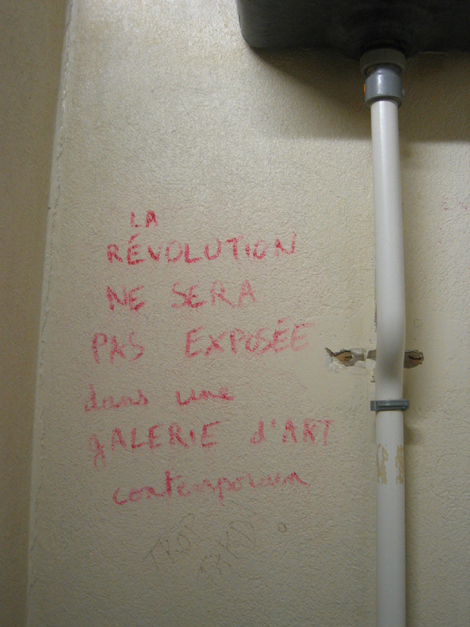 Kunsthochschule Grenoble. 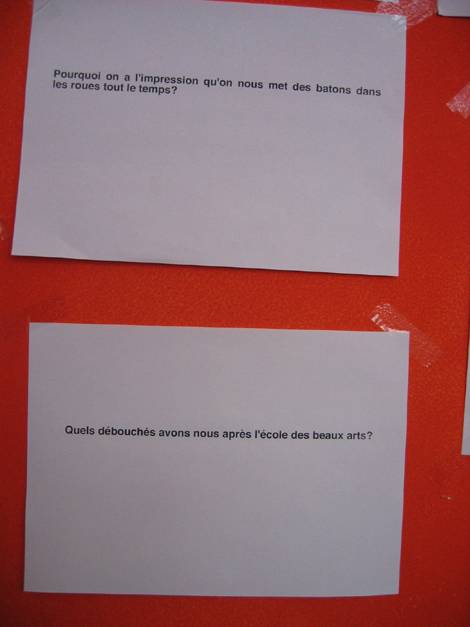 (Ecole Superieure d'Art Grenoble ESAG) Diskussionsveranstaltung 6. 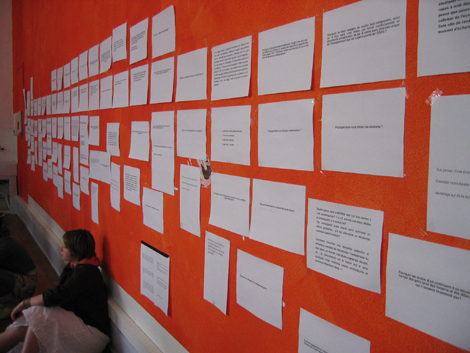 Mai 2008 Fragen, die eine Woche vorher von den Studierenden eingereicht und an der Wand der Cafeteria aufgehängt worden waren. Autonomie28. Ist es möglich, eine selbstverwaltete Studentische Vereinigung zu gründen um in der Cafeteria Mittagessen zu verkaufen? Ich denke man könnte sich an der Café-Bar in der in der Architekturhochschule ein Beispiel nehmen. Also einen Service anbieten und eine Möglichkeit des Austauschs generieren? 29. Ist es möglich, einen studentisch organisierten Ciné-Club (Film-Club) zu gründen? Dieser Club könnte eine Veranstaltung pro Woche abhalten, Ziel wären Partizipation und kritische Diskussion? 48. Kann Kunst, auch immateriell, ausserhalb eines Marktes von Angebot und Nachfrage existieren? 73. Wie lehrt sich Autonomie? Wie lernt sich Autonomie? Wie entwickelt sich Autonomie? Wie lässt sich Autonomie evaluieren? Wie lässt sich Autonomie beurteilen? Wie erweitert / vertieft sich Autonomie? 104. Lernt sich Autonomie bei der Arbeit, wenn man in die Kunsthochschule gelassen wird? 103. Können wir uns eine Verwaltung vorstellen, die den Studierenden mehr Einfluss überlässt? 79. Liegt die Zukunft der Kunsthochschulen nicht im Selbständigwerden ihrer Studenten - oder bescheidener: in ihrer Partizipation am Funktionieren ihrer Hochschule, an internen Entscheidungen ihrer Hochschule, an den Wünschen ihrer Hochschule, an der Ethik ihrer Hochschule - kurz: an der Politik ihrer Hochschule? 88. Wird eine noch autoritärere Lehre die individuelle Entwicklung des Einzelnen einschränken? 21. Wie kann man in einer schonungslosen individual-kapitalistischen Welt, "in der Konsum die herrschende Parole ist und in der wir als Individuen herumirren und freie Elektronen sind", eine kollektive künstlerische Entwicklung fördern, die in der Lage ist, die Immaterialität der Wirklichkeit zu transzendieren? Gemeinschaft24. Sind wir noch in der Lage, uns zu verbünden und für die selbe Sache einzusetzen? Uns zu einigen? Energieträger zu sein? Sind wir in der Lage, die Wirklichkeit mit Wünschen und Utopien zu transzendieren um nach entstehenden Möglichkeiten zu streben? 62. Wie erreicht man, daß unsere Hochschule eine noch stärkere Platform für Austausch und gegenseitige Unterstützung wird? 67. Wie kann man die Beziehungen zwischen den Professoren verbessern? Wie kann man ermöglichen, daß unsere Hochschule eine noch stärkere Platform für Austausch und gegenseitige Unterstützung wird? 7. Kann man aufhören, sich gegenseitig anzuschreien? 8. Wie kann man eine Struktur bereitstellen, die günstig für schöpferische Tätigkeit ist? ( in einem physischen Raum und mit den Personen, die daran teilhaben)? 97. Ist es wichtig, einer Klasse anzugehören? Manche haben bei einem Treffen daran erinnert, daß ein Zugehörigkeitsgefühl zu einer Gruppe eine Dynamik erzeugt; die Gruppe könnte bei kurzen Workshops zwischen den 2 jährlichen Modulen gebildet werden? Oder in Workshops mit Studenten verschiedener Hochschulen? Verstehen 37. Woher dieser plötzliche Wille, alles zu verstehen, wo doch meiner Auffassung nach die ständige Re-Aktualisierung (und damit keine einseitige Ausrichtung der Lehre) die Besonderheit der ESAG ist? 38. Warum will man vereinheitlichen, was sich wie ein Magma der Reflexionen nahe am Chaos den Studenten als Möglichkeit bietet, ihren eigenen Studiengang zu bestimmen? Geschieht das nur, um den Bedürfnissen der Institution gerecht zu werden? 39. Falls ja, reicht es, nicht aus, mit institutionell gebräuchlichem Vokabular (Kommunikation / Protokoll) zu antworten, um die Effektivität der Hochschule zu beschreiben - d.h. mit der quantifizierbaren (messbare) Zahl der Initiativen pro Jahr, Ausstellungen, Kundgebungen, Debatten, Soirees, Vorträge, Internationale Austausstudenten... Wissen101. Wie kann man Austauschmöglichkeiten zwischen den verschiedenen künstlerischen und zugehörigen Fakultäten in Grenoble schaffen (Architektur, Theaterwissenschaften, Philosophie, Soziologie der Kunst...)? 15. Was sind die Streitfragen der Gegenwartskunst? Bietet uns diese Hochschule eine wirkliche Wahrnehmung der Kritik in unserem Kontext indem sie uns ermöglich, die Streitfragen der Kunst zu erkennen? 16. Gibt uns die Lehre ausreichend Wissen, um die Welt kritisch und mit Scharfblick wahrnehmen zu können – um nicht einfach Formen zu schaffen, die Spiegelbild einer Welt sind, die uns passt, sondern die auch eine Distanznahme schaffen um diese Welt zu hinterfragen und zu versuchen, sie in Frage zu stellen? 17. Bräuchten wir nicht wirkliche Kenntnisse in umfassenderen Bereichen, die uns in einen künstlerischen Prozess und künstlerische Forschung einbinden (Humanwissenschaften: Philosophie, Psychologie, Ethnologie, Geometrie, Astronomie, Religion, Geographie, Geschichte, Kunstgeschichte...)? Reichen unsere "culture-générale" Kurse aus, um diese Frage zu beantworten? 31. Spendet die ESAG genug Wissen um die gegenwärtige Welt interpretieren zu können? 52. Was kann man an Kunst studieren? 66. Wie kann man den Studierenden ermöglichen, sich anderen Bereichen der Humanwissenschaften zu öffnen? 78. Wenn die Studierenden der ESAG fordern, in klassischen Grundlagen (Form, Farbe, Licht, Raum) ausgebildet zu werden, die Kunstgeschichte seit Beginn der Menschheitsgeschichte und auch von Kontinenten, die von der Gegenwartskunst verborgen werden aufzugreifen, wie reagiert die Hochschule auf diese Forderung? Entscheidung22. Welchen Manövrierspielraum haben Institutionen wie die ESAG? 60. Welchen Platz für jeden der Akteure? 80. Ist Leiten = informieren? 34. Mit dem Wissen daß im ECTS System gemäß der folgenden Abstufung die Noten verteilt werden: A : die besten 10%, B : die folgenden 25%, C : die folgenden 30%, D : die folgenden 25%, E die restlichen 10% und daß andererseits die USA 47% des Gegenwartskunstmarktes beherrschen, Großbritannienn und China 20% und Frankreich 6% - glaubt ihr dass die statistischen Kurven zum Register der Zeichnung oder der Wirtschaft gehören? Stellt ihr eine Verbindung zwischen Freiheit, künstlerischen Formaten und ökonomischen Entscheidungen her? 71. Wenn Kunst überall ist, kann man sich dann vorstellen, dass der Kunststudent auch überall ist – als aktives Mitglied der Lehre an seiner Hochschule? 81. Da Kunst überall ist, da Selbstorganisation eine Kunst ist, da die Kunst der Entscheidung jeden betrifft, was ist dann mit der Entscheidungsfähigkeit des Studenten – des Studenten, der auch überall ist? 32. Existiert in der Kunsthochschule weiterhin die bürgerliche kulturelle Tradition, die romantische Formen des spontanen, instinktiven oder unbewussten Genies hochschätzt? Kunsthochschule42. Warum gibt es Hochschulen, um Künstler, Musiker oder Filmemacher zu werden, aber keine um Schriftsteller oder Poet zu werden? 43. 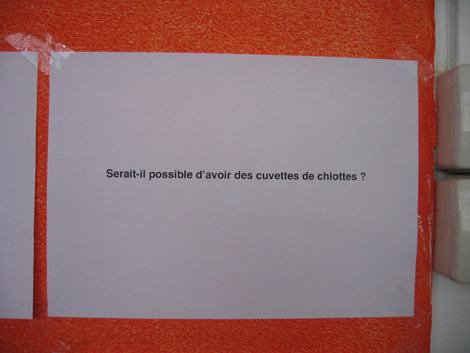 Welchen Ort hat die Kunsthochschule in Grenoble? An welchem Ort könnte eine Kunsthochschule in Grenoble stehen? 49. Gibt es genausoviele Schulen wie Studierende in einer Schule? 50. Was ist der kleinste gemeinsame Nenner zwischen zwei Studierenden an einer Kunsthochschule? 51. Könnte man den kleinsten gemeinsamen Nenner als Ausgangspunkt für ein Projekt der Hochschule nutzen? 59. Wer stellt die Identität dieser Hochschule her? 61. Wie kann man dieser Schule einen neuen Atem geben und dafür kämpfen, dass sie nicht verschwindet? 72. Warum ist die Verwaltungsstruktur der ESAG nicht so zugeschnitten, dass sie auf die Ziele und Besonderheiten einer Kunsthochschule eingehen kann? Wie können wir unsere Mittel in Synergie mit der Dynamik der Lehre bringen? Was für Werkzeuge für Informationsfluss und -verbreitung entwickeln und etablieren? 90. Ist das Gerücht der Schliessung der ESAG aufgrund der Nationalisierung der französischen Kunsthochschulen wirklich wahr? 96. Was bedeutet es, Kunststudent zu sein? Bildet die Kunsthochschule Künstler aus? Muss man eine Kunsthochschule besuchen, um Künstler zu sein? Was bringt eine Kunsthochschule noch? Techniken? Theorie? Kritische Betrachtung der eigenen Arbeit? Richtigkeit? Zugang zu einem Netzwerk? Eine Gruppe mit der man gemeinsame Motivationen entwickeln kann und mit der man etwas schaffen kann? Was ist am wichtigsten? Wie kann man maximal von den paar Jahren des Studiums profitieren? 107. Geht man auf eine Virtuelle Kunsthochschule zu? 121. Ist es nicht interessanter, sich der Kunsthochschule wie eines Werkzeugs zu bedienen, anstatt Werkzeug der Kunsthochschule zu sein? Evaluation19. Welchen Wert, welche Glaubwürdigkeit will man der Gegenwartskunst zusprechen? Gibt es noch einen Platz, der dem Lehrer gewidmet ist? Der Forschung? 20. Ist daher unsere Arbeit mit dem gleichen Problem konfrontiert? Wie kann sie existieren wenn sie abgewertet oder diskreditiert wird? 25. Ist es möglich, schriftlich zu bekommen, wie das System des Übergangs von einem Studienjahr ins nächste funktioniert (Notengebung, Wiederholungen, Nachholung von ECTS?) und alle Regeln transparent zu machen? 98. Wie läuft der Jahresabschluss nach dem ersten Studienjahr ab? Gibt es zwei Prüfungen? Eine schriftliche Arbeit? Wie läuft das zweite Jahr für die Überlebenden ab? Erfahrung87. Sollte man nicht ältere Studenten mit mehr Erfahrung aufnehmen, die besser in Verbindung mit der Wirklichkeit arbeiten können? 82. Kann man die ideale funktionelle, administrative, pädagogische und organisatorische Struktur einer Institution schaffen, die auf eine künstlerische Lehre und Ausbildung wie an einer Kunsthochschule verzichtet, zugunsten einer Vorstellung von Erfahrung von Forderung und Forderung von Erfahrung? Innovation45. Werden wir überrascht sein? 83. Kann man die traditionellen Haltungen der Lehre rechtzeitig umstrukturieren? Was sind folglich die hypothetischen und erneuernden Haltungen in Bezug auf die künstlerische Lehre zwischen Lehrendem und Studierendem? Institution (Struktur)93. Ist eine Kunsthochschule nicht nur ein Gebäude? Können wir nicht anderswo Kunsthochschule machen? Kurse im öffentlichen Raum abhalten, wenn es sich um treffen und Diskussionen handelt... für die man mitunter nicht einmal einen Tisch benötigt? Warum nicht Vorträge in Organisationen ausserhalb der bildenden Künste verlegen? und im Austausch Vortragende einladen, die von der anderen Organisation vorgeschlagen wurden? Muss ein Künstler nicht offen sein? Sich für das Zeitgeschehen interessieren...Literatur, Wissenschaft,Philosophie, Geschichte...? 94. An Lehrende, die schon an anderen Schulen gearbeitet haben: beeinflusst Ihrer Ansicht nach die Struktur Ihre Art, zu lehren? Oder die Lehre selbst? 95. An die Studierenden: Denkt ihr wirklich, dass die Struktur unsere Art, Student zu sein beeinflussen wird? Beschäftigung mit dem Ort, Motivation, Gruppendynamik... Löst eine Verlängerung der Stunden das Problem? Wer ging zum obligatorischen Englischkurs? Wie kann man eine Dynamik herstellen, die für künstlerische Tätigkeit geeignet ist? Erinnerung30. Wenn das Subjekt die Fähigkeit verloren hat, seine Vergangenheit und seine Zukunft in einer kohärenten Erfahrung zu ordnen, wird es ziemlich schwer zu sehen, wie die kulturelle Produktion solch eines Subjekts in etwas anderem enden kann, als in einen "Haufen Fragmente" und einer Praxis des Heterogenen, des zufälligen und willkürlichen Fragmentarischen. Wenn wir unfähig sind, die Vergangenheit, Gegenwart und Zukunft eines Satzes zu vereinen, dann sind wir auch unfähig, die Vergangenheit, Gegenwart und Zukunft unserer eigenen biographischen Erfahrung und unseres psychischen Lebens zu vereinen. Was passiert wenn man Subjekt mit Hochschule ersetzt, wie von Frederic Jameson vorgeschlagen? 35. Wie gibt man eine Zukunft weiter? 46. Kann man so tun, als ob die Welt morgen anfängt? 47. Beginnt die Welt morgen? 85. Kann man in der Unbeweglichkeit und Erwartungshaltung die eigene Strategie und Positionierung überdenken? Kann man eine Zukunft schaffen, ohne sich auf die Begriffe des Erbes und des nationalen Kulturguts zu stützen? Was ist das Kulturgut einer Kunsthochschule - und besteht in einer Kunsthochschule überhaupt ein Erbe, das geteilt und weitergetragen wird? Lehre / Pädagogik 11. Was kann man von einem Künstler/Lehrer erwarten? 3. Kann man eine Pädagogik der Begleitung eines Projekts denken und nicht nur der Beurteilung eines Projekts? 2. Kann man Pädagogik machen ohne gemeinsam die Fragen zu denken, die sich den Studierenden stellen? Was für eine Beziehung besteht zwischen Professor und Student? 9. (Wenn man eine Kunsthochschule wie eine soziale Struktur betrachtet-) Benötigt man ein hierarchisches System: Professor – Student und Student – Student? 33. Beginnt die künstlerische Ausbildung bei den Fundamenten, oder muss man in der Mitte anfangen, wie Gilles Deleuze vorschlägt? 41. Warum ist es möglich, die ESAG zu absolvieren ohne ein Buch realisiert zu haben, was doch auch heute noch ein unentbehrliches Werkzeug ist, um mit Professionellen Künstlern und Institutionen in Austausch zu treten? 86. Wie könnten sich Diversität und Pluralität der Methoden annullieren? Wie kann in einer Umstrukturierung durch Elimination von Kunsthochschulen und einer globalen Uniformisierung die traditionelle Vielfalt und der Reichtum der Methoden der künstlerischen Lehre weitergeben werden? Kann man durch Subtraktion hinzufügen? 89. Könnte man im Unterricht mehr Hinweise auf die Methoden der Evaluation haben? 57. Kann man Studenten ausbilden mit Hilfe einer Pädagogik, die garantiert, dass diese bei Vollendung ihrer Studien vollständige Künstler sind? Modulsystem 1. Geschieht die Lehre an der Kunsthochschule nur durch die Form (im Modulsystem – eine Lehre die jedes Jahr wechselt)? 102. Warum nicht alle Workshops, die im Rahmen eines Moduls angeboten werden, für alle öffnen, um von der seltenen Anwesenheit der Vortragenden zu profitieren? 7. Ist es vorstellbar, Module vorzuschlagen, die von zwei Professoren zusammen organisiert werden und über einen längeren Zeitraum als ein Semester laufen? Sie könnten sich z.B. zwischen den Wochen A und B abwechseln. 5. Kann man ein alternatives System zum Modulsystem (nicht vielfältig genug) und zum Klassensystem einrichten? Zielsetzungen 36. Was sind die expliziten Ziele der ESAG? Der Hochschule? Was sind die expliziten Ziele eines jeden Studierenden? Was sind die expliziten Ziele der Leitung? Was sind die expliziten Ziele des Direktors? Was sind die expliziten Ziele eines jeden technischen und Verwaltungsangestellten der Hochschule? Was sind die expliziten Ziele eines jeden Professors? Müssen um "Hochschule zu machen" die Ziele der einen und der anderen notwendigerweise die gleichen sein? Was ist der Handlungsspielraum eines jeden Akteurs in der Definition des Projekts Hochschule? Kann dieser Spielraum ein dynamischer Faktor in der Konstruktion dieses Projekts sein? 3. Was sind die Ziele und Erwartungen der Hochschule? 54. Was sind die Ziele und Erwartungen der Studierenden? 91. Ist die Motivation der Professoren die Lust, hier gründlich zu unterrichten, oder ist es nur eine Wahl, aus Ermangelung eines besseren Angebots, ohne großen Enthusiasmus angenommen, diktiert von der Müdigkeit des Kampfes? 55. Was ist der Zweck einer Kunsthochschule? Wirtschaft12. Würde es möglich sein, Kloschüsseln zu bekommen? 13. Muss man sich mit der Ökonomie der Mittel abfinden? 14. Wäre die Ökonomie der Mittel ein "Label" geworden? 58. Ist die ESAG eine Hochschule des Sich-Durchwurschtelns? 44. Ist eine Kunsthochschule ein Subsystem des kommerziellen Gegenwartskunstsystems? 56. Warum bilden Kunsthochschulen weiterhin Leute für Bedarfe und Absatzmärkte aus, die letztenendes gar nicht existieren? Post-diplom40. Warum unterstützt die ESAG nicht stärker die Initiativen oder Gruppen, die nach dem Abschluss aktiv sind und direkt oder indirekt an der Ausstrahlung der Hochschule beteiligt sind? 65. Wie kann man die Studierenden nach ihrem Diplom weiter begleiten? 134. Welche Berufsaussichten haben wir nach dem Kunststudium? Netzwerk63. Wie kann man die Kunsthochschule Grenoble nach aussen öffnen und an neue Netzwerke anbinden? 92. Es gibt wenig Bewegung in der Hochschule – wenig Studenten, oft die gleichen, wenige gelegentliche und regelmässige Vortragende, selten Studierende anderer Fakultäten und nie Personen, die ausserhalb der Bildenden Kunst stehen. Warum? Ist es nötig, im Mikokosmos der Schönen Künste zu verharren? Sind die Vorträge offen für die Öffentlichkeit? Falls ja, wie wird diese informiert? Technik10. Kann man eine Technik lernen und meistern, ohne sich in seiner Lehre einzuschliessen? 18. Welche Mittel und Werkzeuge stehen uns zur Verfügung, um eine bildnerische Forschung zu etablieren, die mit der Künstlerischen Forschung im Einklang steht? Um eine gewisse formale Schärfe zu erlangen? 4. Kann man wirklich Lehre der Kunst ohne irgendeine Lehre der Technik anbieten - obwohl die Studierenden nach einer solchen verlangen? 75. Da die Geschichte gezeigt hat, dass die Kunsthochschule nicht das war, was die Kunst produziert hat (oder den Künstler), und da der ANTI-AKADEMISMUS heute eine gewisse Form des Akademismus repräsentiert, ist es nicht nötig, zu überdenken, was man unter AKADEMISMUS und ANTI-AKADEMISMUS versteht und schliesslich vorzuschlagen, unabhängig zu einer wirklichen Ausbildung des Studierenden zu gelangen, der darunter leidet, an einer Kunsthochschule nicht seine Fachkompetenz (Technik und Theorie) vertiefen zu können? 58. Unsere Schule leidet einen grausamen Mangel an Werkstattleitern. Können wir uns die Einstellung eines Werkstattleiters für Konzeptkunst vorstellen? Zeit99. Wie kann man die Zeit, die man zum Denken braucht mit den Terminen der Hochschule in Einklang bringen (Deadlines)? 64. Wie kann man unserer Schule in Grenoble zu mehr Sichtbarkeit verhelfen? 76. Was ist das racial profiling an einer Hochschule der Bilder? Einige der Vorschläge, die aus der Diskussion am 6.Mai entwickelt wurden: 161. Autonomie erfordert die Definition, Etablierung und Formulierung der Spielregeln. 137. Die Hochschule muss den Studierenden deutlicher die Spielregeln zu verstehen geben. Ihnen sagen: "Ihr werdet eure Vorgehensweise und und eure Autonomie entwickeln, dies ist euer Handlungsspielraum, ergreift selbst die Initiative, alles beruht auf Eurer Initiative, man begleitet Euch, wartet nicht auf uns." 162. Die Spielregeln werden in einem Studienführer formuliert, der ein Programm enthält, sowie die Zielsetzungen, die Rollen eines jeden Mitglieds der Hochschule, ein Organigramm, die Ressourcen die zur Verfügung stehen und deutlich formuliert, nach welchen Prinzipien der Zugang zu diesen funktioniert. 158. Einstellung eines Professors für Philosophie. 141. Eine Struktur, die Informationen über Ehemalige sammelt. 142. Eine Vereinigung der Ehemaligen Studenten? 150. Ein Ideen-Sammelkasten für die Module. 149. Handwerkliche Ateliers in die Module integriert. 143. Ein Modul "Labor der künstlerischen Forschung" (über mehrere Jahre) mit Verlängerung eines Teils der Studenten in jedem Trimester. 144. Mehrere Module, die um "Familien" herum gruppiert sind (Beispiele für Familien: Räume, Narrationen...) mit gemeinsamen Terminen der Studierenden und Lehrenden. Die Studierenden hätten die Möglichkeit, im Verlauf eines Semesters zwischen den Modulen einer Familie zu rotieren. 145. Raum für Selbstmotivierte Projekte: ein Modul das von mehreren Lehrkräfte begleitet wird mit dem Ziel, Studenten zu unterstützen, die ein Projekt aus persönlicher Initiative heraus realisieren wollen (maximal 2 mal in 5 Jahren). 139. Ein Hochschul-Netzwerk entwickeln (mit kleinen Praktika). Beispiel: "Goldenes Zeitalter", Hochschulen des Südens. 163. Man muss das Prinzip der Verantwortung auf gegenseitiger Basis neu proklamieren: Was man gibt, bekommt man auch zurück. Und die Verpflichtung für jedes Mitglied der Hochschule, die Spielregeln zu respektieren. 157. Technik lehren mit Bezug zur Geschichte der Technik und mit Bezug zu anderen Künstlern, die diese Technik nutzen. 159. Das Feld der Techniken auf die Sozialwissenschaften und Meinungsforschung ausdehnen, sowie auf politische Methoden (Kampagne, Plakatierung, Geschichte der Arbeiterbewegung). 151. Öffnungszeiten vor Semesterbeginn um sich für das Jahr zu organisieren. 152. Die Fassade des Gebäudes für mehr Sichtbarkeit nutzen (den Vorplatz nutzen, die Fassade bemalen). 154. Den wiki wieder ins Leben rufen – auch mit Präsentationen der Professoren.